I have been playing on Pinterest again, which is both fun and frustrating at the same time right now because of my broken hand! I see so many cute things, but I can't do them with only one hand. 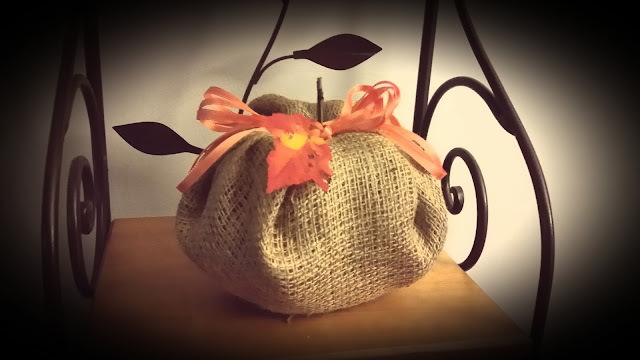 I saw this craft using a toilet paper roll and fabric to create a little pumpkin and thought maybe I could do it with one hand. I can use my right hand in an extremely limited way, but for the most part, it's pretty useless. 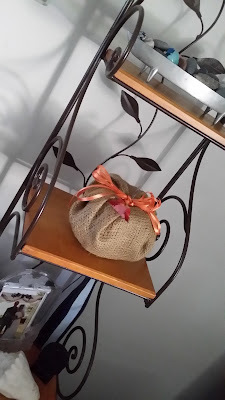 I didn't have any orange fabric, so I thought maybe it would be cute made out of burlap. I added a little orange ribbon and a Fall leaf. You can find detailed instructions and what they are REALLY supposed to look like at the blog below. Don't you think hers turned out cute? I think the lighter weight fabric she used worked better than my burlap! Very nice pumpkin. I actually like the burlap with the orange ribbon. Very rustic!